Breeder Mark Jennings is pictured with Ellie Ramsey’s champion and reserve champion at the Skipton Beltex show. Cumbrian Ellie Ramsey, of Crake Hall, Selside, near Kendal, saw her February, 2006, ram lamb Hallcrake King (CMJ K66) awarded the title by judge and breed expert Steve Gibbons, who himself farms 280 Beltex ewes at Hay-on-Wye in Wales. Out of Challenger Venus, the victor is by Horseclose Foreman, whose pedigree goes back to the noted sire King Pin. The title winner, exhibited by breeder Mark Jennings, sold for the day’s top price of 2,000 guineas to Frank and Auriel Robinson, of Tetford, Lincolnshire. The same sire was also responsible for Ellie Ramsey’s reserve champion - a February, 2005, twin shearling ewe, Hallcrake Jenni (CMJ J41,) which sold for 750gns to Sue Wilkinson, of Richmond North Yorkshire. Open for the first time to all Beltex Society members, the show attracted a 141-strong pedigree entry, including a good number of sheep that had also turned out at the Northern Beltex Club’s first-ever National Progeny Show at Skipton at the end of July. 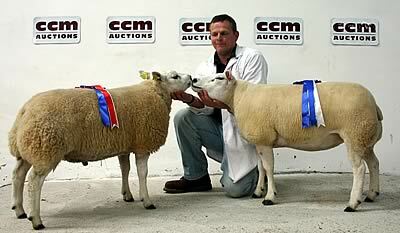 The success of both fixtures cements the growing popularity and stature of the breed in the North of England, with the Northern Beltex Club experiencing a significant rise in membership as farmers increasingly see the benefits of placing Beltex rams on commercial ewes to produce top quality carcasses for butchers. The latest sale got off to a flying start when the first lot, a well-respected aged ram and sire of many prize winners, from Richard Findlay, of Quarry Farm, Westerdale, Whitby, sold for 1,000gns, to Scottish breeder W McIntyre, of Dalton, Lockerbie. Richard’s Westerdale Beltex flock also had major success in the ring when his pen of 11 shearling lambs sold to an average of 611gns, a major talking point of the day. Thomas and Judith Hunter, of Newtown Farm, Hunmanby, Filey, saw their first prize shearling ram sell for 1,050gns to John Mellin, of Long Preston, though top price in this class at 1,250gns was achieved by Lancashire breeder Michael Barnes, of End Meadows Farm, Fence, near Burnley. The buyer was Nick Dalby, of Harrogate. The show was sponsored by chartered surveyors Windle Beech Winthrop, based at Skipton Auction Mart, and Windmill Landrovers, of Blackburn. Aged Ram – 1 RG Findlay, Westerdale, 2 GR Barrett, Sutton-in-Craven. Shearling Ram - 1 T Hunter, Hunmanby, 2 AC Hutchinson, Kirkby Wiske, 3 DR Findlay, Coverham. Ram Lamb – 1 E Ramsey, Selside, 2 S & GA Potter, Topcliffe, 3 DR Findlay. Ewe – 1, 2&3 GR Barrett. Shearling Ewe - 1 E Ramsey, 2 R & R Tillotson, Clitheroe, 3 BT Breaks, Newton-in-Bowland. Ewe Lamb – 1&3 AC Hutchinson, 2 E Ramsey. Aged Ram - RG Findlay 1000gns to W McIntyre. Shearling Ram - BT Breaks 660gns to N Dalby, 600gns to KW & A Gill, 600gns to MP Jennings. M Barnes 650gns to RN & P Mees, 1250gns to N Dalby, 650gns to R Falshaw. RG Findlay 700gns to N Jennings, 700gns to M Davies, 650gns to HW Cowling, 720gns to F Joel, 720gns to MP Jennings, 620gns to BM Dean. T Hunter 1050gns to J Mellin. Ram Lambs - S & GA Potter 600gns to TH Peel, D Findlay 500gns to Marshall Farms, 480gns to GW Allison, 390gns (x2) to GW Allison, 400gns to Saddle End Farms, 370gns to A Avison. E Ramsey 2000gns to FS Robinson, 500gns to D Cruikshank. Aged Rams to 1000gns (av £1050), Shearling Rams to 1250gns (£452), Ram Lambs to 2000gns (£343), Aged Ewes to 220gns (£220.50), Shearling Ewes to 750gns (£260.80), Ewe Lambs to 600gns (£325.50).